The Cuisinart KIT CDST1-S4HG-2 is 2 pack of 16-piece ceramic dinnerware set, which is available in a variety of irresistible styles, shapes and colors. This dinnerware set is designed with vibrant colors and subtle textures. The dinnerware has dark & light matte finish and bright color glazes which create the perfect look for cozy vintage-style kitchens to glamorous dining rooms. It is a perfect choice for breakfast, lunch or dinner. 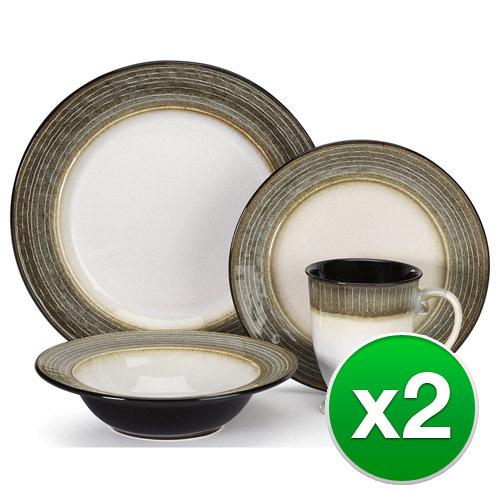 The Loire Dinnerware Collection Stoneware 16Pc Set-Bundle Of2 has many exciting features for users of all types. You can extend the lifetime of your Loire Dinnerware Collection Stoneware 16Pc Set-Bundle Of2 with the purchase of a FactoryOutletStore Factory Protection Plan. The Loire Dinnerware Collection Stoneware 16Pc Set-Bundle Of2 is sold as a Brand New Unopened Item.